Paymentsense is a payment service provider with products for taking in-store, online, phone and mobile payments. From humble beginnings in 2009, Paymentsense has quickly grown to become a key player in the payment industry, helping over 60,000 small businesses power their card processing. In this article, we put Paymentsense to the test to see how well it measures up against its competitors. Let’s get started. Almost ten years ago, Paymentsense’s founders, George Karibian and Jan Farrarons, decided to set up a payment processing company that supported small businesses. They believed big banks were unfairly prioritising larger companies and that was leaving SMEs paying unstainable fees. Paymentsense was designed to be fair and affordable for even the smallest business. Since appearing on the Inc. 5000 Europe, a table of Europe’s fastest-growing businesses, Paymentsense has gone from strength to strength, winning new customers and expanding their range of services. Nowadays, Paymentsense has a wide range of products to support payments in-store, online, over the phone and on the move. Whether you need a fixed card machine or an online payment gateway, Paymentsense probably has a product for your needs. In the list below, I’ll look at three of the most popular — card machines, online payments and integrated payments. So Paymentsense obviously has a good range of services but there is some disagreement about the quality of the service they provide. There’s a high level of complaints pertaining to the quality of Paymentsense’s service. In particular, some users single out long contract lengths and unexpected fees as common problems. it may be worth reading through these for yourself before you make a final decision. Reviews for Paymentsense are fairly mixed. On Trustpilot, the business boasts a rating of 4.1 out of 5 but that drops to 2.4 out of 5 on Review Centre. Take a look at the reviews I found. That gives a weighted average score of 3.88 out of 5, which is fairly positive. However, there are a lot of negative reviews and comments out there, which is something to bear in mind. 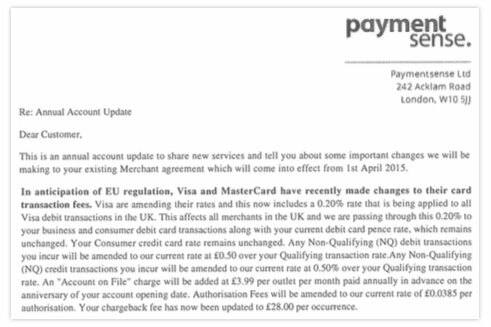 In 2015, Paymentsense wrote to its merchants advising them of significant fee increases following changes to Visa debit interchange costs. Have you ever heard that old saying You might as well be hung for a sheep as a lamb? The folks at Paymentsense certainly have! 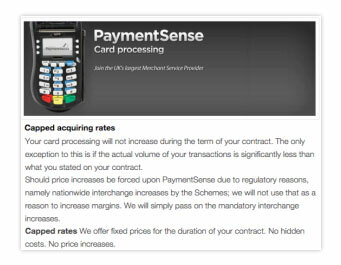 Paymentsense doubled down on the increases and rolled out price hikes well in excess of the changes to interchange cost. This will undoubtedly infuriate thousands of customers who feel this is a breach of Paymentsense’s promise to cap fees “for the duration of your contract.” Here is a summary of the increases. Here’s an extract from a letter we have been sent by one of Paymentsense’s customers. Below are some important points regarding the Visa debit card fee increases. Chip and pin: Rates are increasing by 0.2% whereas interchange costs have only increased by 0.2% less 7p. So, customers are paying an extra 7p per transaction in excess of interchange costs payable to Visa Europe. In the case of business debit, the extra is actually 10p. Telephone and non-secure eCommerce: Rates are increasing by 50p in excess of the chip and pin rates. Interchange costs have only increased by 7.5p. So, customers are paying an extra 49.5p (50p – 7.5p + 7p) in excess of interchange costs payable to Visa Europe (or 52.5p in the case of business debit). Paymentsense confirmed to us that this increase applies to all telephone transactions, even if CVV2 data is captured. Interchange cap: Interchange payable to Visa Europe is capped at 50p for chip and pin transactions and £1 for telephone and non-secure eCommerce transactions. Prices paid by Paymentsense’s customers are not capped. Non-qualifying transactions (telephone transactions without CVV2 and eCommerce transactions not using 3-D Secure) now incur a charge of 0.5% above the qualifying rate. There has been no increase in interchange costs for non-qualifying credit card transactions, so customers are paying an extra 0.5% above the interchange increases, which, interestingly, were nil. A £3.99 per outlet per month fee is now paid annually in advance. So, that’s a new fee of £47.88 per year per outlet. If you have five shops, that’s an extra fee of £239.40 per year. There is no new service or functionality attached to this fee or any detail about why the fee is being levied. An authorisation fee of 3.85p per transaction has been introduced. Some, but not all, other providers also charge an authorisation charge. Contrary to what Paymentsense promised, customers may feel aggrieved that the recent increases are clearly higher than the interchange increases as demonstrated above. They’ll also feel aggrieved that Paymentsense have introduced new charges being introduced. For example, authorisation charges and account on file charges. Until recently, the Price Guarantee message was prominently displayed on PaymentSense’s website and it is still used by affiliates like PaymentSense Plymouth and by the company’s salespeople. What does the Paymentsense merchant contract state with respect to their Price Guarantee? Surprise, surprise! It says nothing! Capped Rates applies only to personal credit and debit card rates for the duration of the contract; if acquirer personal card credit and debit rates increase during the contract period, then Paymentsense reserves the right to increase personal credit and debit card rates to cover those costs. You’ll note the Terms and Conditions are very different from the marketing promise in that they only cover personal cards and exclude business/corporate cards. Also, they don’t mention interchange at all and instead refer to the acquirer rates, which are the rates charged to Paymentsense by its acquirer, First Data. We have demonstrated that the Payment Guarantee promise is clearly broken but are the Terms and Conditions? We think it is unlikely that the increases are reflective of the First Data increases without any additional margin from Paymentsense. Finally, if you are unhappy and wish to change to a different merchant service provider, I urge you to try out Cardswitcher. We compare hundreds of deals to find the best offer for your circumstances. The majority of SMEs who test our service end up saving money—so what are you waiting for? 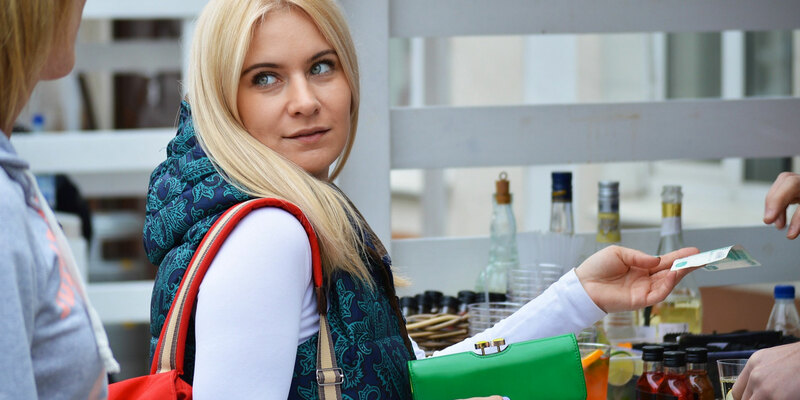 While Paymentsense is a great merchant service provider, we always recommend merchants review the market and see what’s actually on offer before they decide on a provider. To see what payment options are available to you, click here to go to our comparison engine.